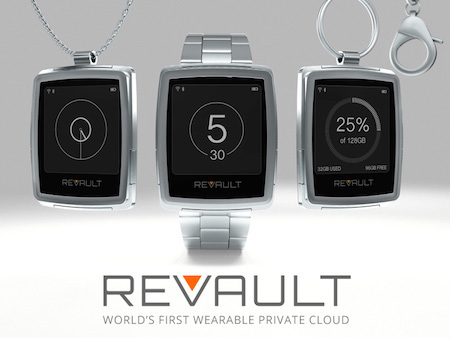 I really love the pitch for the Revault device, which is billed as the world's first wearable private cloud. However, I'm puzzled - is this a real device, or an extended effort to replay the idea of corporate vaporware on a small business scale? Do you trust your data in the cloud? Every day it seems there’s another reason not to: Government surveillance, hackers, and big corporations all threaten our privacy online. What if there was a private and secure way you could sync and access all your files from anywhere, on any device and any time - even without an internet connection? You wouldn’t need the public cloud. This sounds great, but It seems to me that they are in about Day 140-something, and have spent a lot of time trying to get their Indiegogo kickstarter video right. A wearable private cloud that is vaporware? Anyway, if it ever gets off the ground, I want one. I (and many other sf fans, no doubt) will remember the Schrön Loop from Dan Simmons excellent, award-winning 1989 novel Hyperion. The Schrön loop was tiny, no larger than my thumbnail, and very expensive. It held countless field-bubble memories, each capable of holding near infinite bits of information. Schrön loops could not be accessed by the biological carrier and thus were used for courier purposes. A man or woman could carry AIs or complete planetary dataspheres in a Schrön loop.